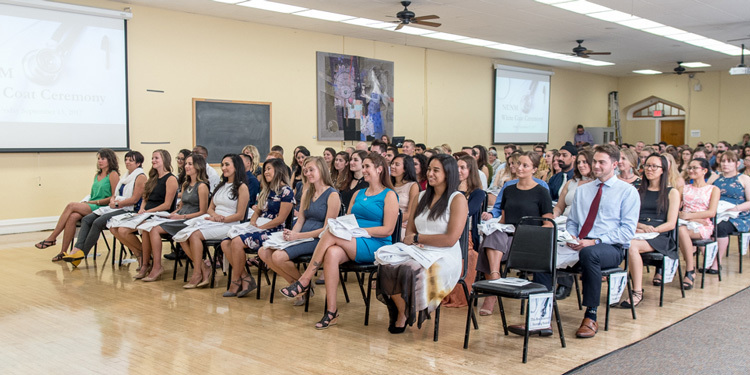 The White Coat Ceremony was established in 1993 by Dr. Arthur Gold at Columbia University as a way to signify to students the importance of compassionate care in their work with patients. At the request of our students, NUNM was eager to adopt this ceremony beginning in 2013. 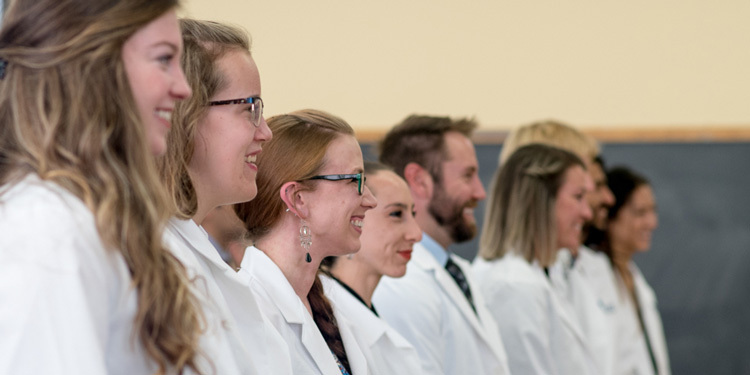 We invite you to join us as we mark this important milestone of understanding and commitment in our students’ journey to becoming exceptional physicians. 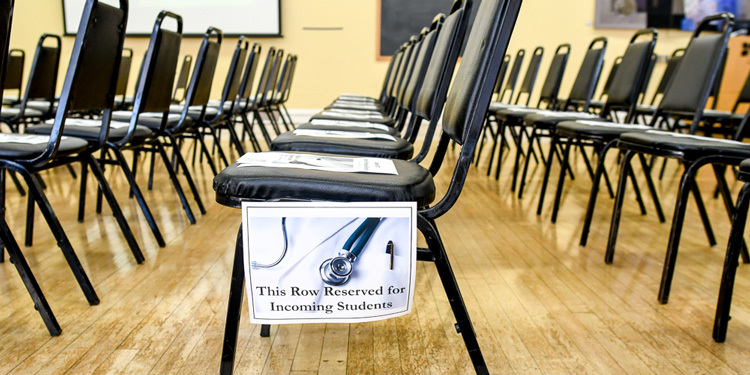 September 14, 2018, 2 p.m.
To participate, please click here: order NUNM white coats, name tags, and RSVP for the ceremony no later than July 27, 2018. The link contains size charts for coats, but you may also try on a white coat at the NUNM student store (1st floor, north wing of the main academic building) before ordering. Students may not use non-NUNM-logo lab coats in the clinic. You must bring your white coat with you to the ceremony. Please pick up your coats prior to 3:00 on Thursday, Sept. 13. Your coats are being held for you in the Faculty Support office – downstairs in the Admin building, Suite 155. Faculty Support office hours are Monday-Thursday, 10 a.m. to 3 p.m.
Professional attire and your new white coat is required. The most common forms of attire are shirt and tie, dress, suit without a jacket (it won’t fit under your white coat) or a blouse with a skirt or slacks. If you are not sure of what to wear, attending in business casual attire would be appropriate. Please refrain from casual attire. Please do not wear jeans, sneakers, t-shirts, tank tops, shorts, or any other casual clothing. Flip flops should not be worn. The day of the ceremony, please meet at 1:15 p.m. in Room 301 to receive your ceremonial line-up and instructions. Bring, but do not wear your NUNM white coat. Please arrive no earlier than 1:15 p.m., as Mitchell Hall will be in use until that time. Families and friends are welcome to park in the following lots (no visitor passes required that day). Non-numbered spaces in the West and East lots of the Academic Building (049 SW Porter St.), entrances on SW Porter St.
NUNM Health Centers parking lot, across from the Academic Building, entrance on SW Porter St. The lot at Water Ave/Ross Island Bridge exit, south of the red house), entrance on Water Ave. The lot on the corner of SW Meade St and SW Naito Pkwy, across from Galen’s Way Garden, north of the Administration Building. Entrance on SW Meade St.
You may also park on the street for up to two hours. For questions, please contact Associate Dean Carrie Baldwin-Sayre at cbaldwinsayre@nunm.edu or 503.552.1860. 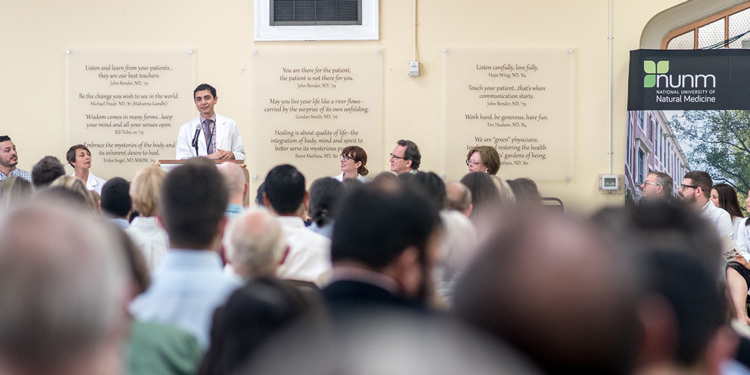 View photos from last year’s White Coat Ceremony.